What better way to prepare for a visit from St. Nick than to write him a letter? Kids love writing to Santa Claus, and it’s a great way for them to practice their writing skills and learn the essential elements of writing a letter. It’s also provides a perfect opportunity for parents to discover what secret wishes kids might only want to share with Santa! This free “Dear Santa” letter printable is a .pdf document that you can download and print out at home. It already has Santa’s name and address at the top, as well as a greeting and closing. Your kids just need to fill out the body of the letter. After your child is done, be sure to save a copy of the letter! These are great fun to re-read in years to come. And then don’t forget to help Santa respond! We offer many printable Santa letter packages that you can print at home, too! 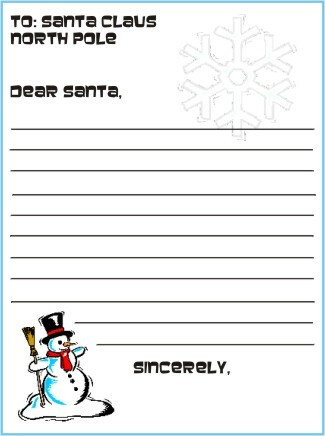 To get your free Dear Santa letter template, simply click the image below to open the document as a .pdf file.